In 2010 a public consultation was undertaken by the DOE (Department of the Environment), regarding the implementation of the 3rd EC Directive On Driving Licences in January 2013. Right To Ride responded to the consultation in April 2010. 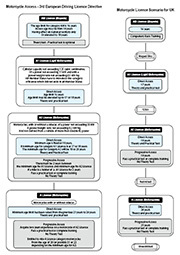 A summary of the Consultation Responses, the Department’s Response, and Next Steps was subsequently published which included information on the drafting of the necessary legislation. The DOE also stated that a communication plan would be put in place to keep stakeholders and interested parties informed of the changes being made and the implementation of the directive here in Northern Ireland. At Right To Ride we then attended on Tuesday 6th December 2011, the first meeting of a stakeholder’s group which will not only advise members of the group of the implementation aspects of the Directive prior to 19th January 2013. Below is our response to the orignal consultation and you can view all our updates, news and FAQs on what this means for riders in Northern Ireland. If you have any questions, which are not in the FAQs please get in touch and we will endeavour to find an answer. EU Driving Licence – Not That Bad! 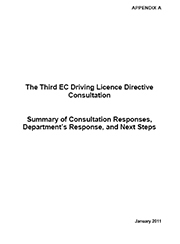 The Department of the Environment (DOE) has silently issued a document on their Road Safety website, which contains the Summary of Consultation Responses, the Department’s Response, and Next Steps regarding the implementation of the 3rd EC Directive On Driving Licences. There were eighteen responses to the consultation, from one large company to five Representative Organisations, two Interest Groups, four from Local Government, three from Central Government, one member of the public and two others. Five of these simply noted/acknowledged the proposals but did not express any views on them. Regarding testing or training between certain licence categories, the Department intends to proceed with the testing option, however the training option will be kept under review with regard to its financial viability. However, the Department will revisit the training option. Any training option will be developed with motorcycle stakeholders to ensure it meets the needs of learner motorcyclists whilst remaining within scope of the Directive. The content of the motorcycle test is specified in the Directive and as such the format of the tests for each category will be the same. However as the rider progresses to the next category of licence they will no longer be restricted to 45 miles per hour which will allow them to be tested at higher speeds on test routes which will be more demanding. In addition the bigger motorcycles will have differing weights and handling characteristics which will ensure that the tests are suitably challenging. Having taken into account the strong views of the respondents the Department has decided that the proposal for a compulsory familiarisation course to validate provisional A2 and A licences under the progressive access route will not now be implemented. Instead all riders wishing to ride category A2 or A motorcycles who have not yet qualified for a full licence for the larger category will have to be accompanied by an Approved Motorcycle Instructor (AMI) when riding on the roads – whether in direct access or progressive access routes. The current provisional licence arrangements for mopeds and category A1 motorcycles which allow riders who have passed CBT to ride unaccompanied on these smaller machines will remain unchanged. The new arrangements for provisional motorcycle entitlement will be similar to those already in place. Currently, a person applying for a moped licence at age 16 will be granted a licence which includes provisional categories A and B. However, these entitlements will only become active when the licence holder reaches the relevant minimum age (i.e. 17). Similarly, a person applying for category A1 at age 17 (after implementation of the 3rd Directive) will also be granted provisional category A2 (which becomes active at age 19) and provisional category A (which becomes active at age 24, unless category A2 is passed, at which time progressive access arrangements apply). The licence holder will not be required to apply for each provisional motorcycle entitlement separately. The Department is now proceeding with the drafting of the necessary legislation. A project team has been set up to oversee the implementation of the 3rd Directive. The project will include an implementation plan which will include a communication plan. This communication plan will ensure that the changes will be fully explained to keep stakeholders and interested parties informed of the changes being made. Staff at DVA (Driver and Vehicle Agency) are working closely with their counterparts (DSA – Driving Standards Agency & DVLA – Driver and Vehicle Licensing Agency) in GB to ensure, where possible, that there is a consistent approach throughout the UK. To this end DVA are represented on a number of GB working groups and are a member of their project board, and in turn DSA are represented on the NI project board. Basically the consultation regarding motorcycles has moved from a starting point at point A and returned to the same point. The only real conclusion is that there will be testing between certain licence categories and not training, although this will be kept under review, with some of the unworkable suggestions that came from the DfT (Department for Transport) in GB being shelved. As an exercise in consultation, the DOE has met its obligation, however the poor response (18 in total) suggests that the DOE is not very good at publicizing consultations. In this case the inadequate response has not really given them the opportunity of drawing from a wider range of views. The best case scenario would be that there was no 3rd Driving Licence Directive to be implemented at all, however what we have ended up with at present for riders is not that bad! We can only hope that the project team that has been set up to oversee the implementation of the 3rd Directive, which includes an implementation plan which in turn will include a communication plan, to ensure that the changes will be fully explained to keep stakeholders and interested parties informed! European Driving Licence Directive Consultation – Madness! Right To Ride has replied to the madness contained in the Department of the Environment’s (DOE) consultation on proposals for implementing the 3rd EC Directive On Driving Licences. This directive voted on and passed in the European Parliament in 2006 must be transposed into national legislation by 19th January 2011 and enter into force as of 19th January 2013. 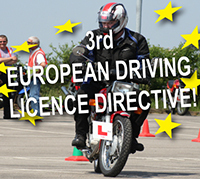 The directive is designed to harmonize motorcycle licences across Europe, although the directive allows members states flexibility at what age they can allow a rider to access the licence categories. The DOE has unfortunately moved well beyond the spirit of the directive. Apart from the complexity of the DOE proposal which was put out to consultation, it offers no benefit to riders. We strongly disagree with the consultation proposals which aim to introduce provisional licences granted for all categories of licence entitlement. In our opinion these proposals are prescriptive and convoluted and badly thought through. The irony is that these proposals will effectively undermine the EU directive on all counts and encourage riders to become “permanent learners”. The DOE proposal wants to allow “novice” riders access to full power motorcycles and to undertake every two years an undefined “refresher course”, to ride indefinitely on a provisional licence. What this means is that the rider will have to take a mandatory refresher course (which the rider will have to pay for anyway), without the benefit of entitlement to a proper licence and a test if they wish to move to a bigger motorcycle. The DOE has simply followed the Department for Transport’s (in Great Britain) recently completed consultation and subsequent report on the directive, which is to impose a provisional licencing system, using as a model, the GB based costs. But the DOE consultation proposals do not define what these “mandatory” refresher courses and tests will actually entail, nor how much they will cost the individual rider. These proposals go against the EU directive which prescribes an option of 7 hours approved training between the categories. Carry out a full cost benefit analysis and regular impact assessment should be carried out based on Northern Ireland calculations and how this affects the people of Northern Ireland. That the training based arrangement should be reviewed and consideration given to the way in which other countries in the European Union are implementing the directive, especially regarding the training route. The Motorcycle Industry in Europe – ACEM (Association des Constructeurs Européens de Motocycles) proposes training for progressive access for riders when stepping up between licence categories and agrees to the 7 hours training as prescribed in the directive. In our view, the DOE consultation has set out proposals which will effectively undermine the EU directive on all counts and encourage riders to become “permanent learners”, by being able to ride indefinitely on a provisional licence. 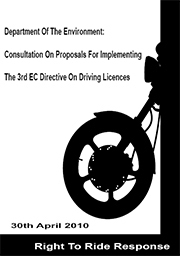 The DOE consultation has moved well beyond the spirit of a process of implementing the 3rd European Driving Licence Directive, which is in itself complicated (albeit understandable) into a prescriptive and unnecessarily difficult set of proposals, which will certainly not give riders any benefits and will not be enforceable. I would never be against training & I’ve attended many superb & instructive courses that have benefited my riding even though I passed my test in 1965. I find it curious that the EU has published data that recognises 80% of accidents involving a motorcycle are NOT the motorcyclist’s fault & yet implements licence directives for motorcyclists only, that oblige further training to progress to bigger bikes. Surely it is CAR DRIVERS that need more training. A youngster who passes a car test at 17 years old can, the same day, drive daddy’s “Cayenne” without further training. Why aren’t younger car drivers under 23 yrs restricted to cars below 1000cc in the same way motorcyclists are ? This is blatant discrimination & reflects that the EU is happy to take on the motorcycle lobby with these Directives but not the super rich super powerful car manufacturer’s lobby. Why don’t out of touch, non-riding politicians & bureaucrats keep their noses out of a transport option they know nothing about. just a quick question… this is all confusing to me. I am 27, I have a CBT, and I`m signing up for a A2 licence before January 2013. Will I still get my automatic upgrade from 125cc bike to any bikes after 2 years? YES or NO?